Automating the process of expense reporting can drastically reduce reporting errors, expose potential areas of expense abuse and improve employee productivity for state and local government agencies, according to a new report. Agencies are discovering that widely available, cloud-based automation tools are translating into greater transparency and control of “employee initiated spend,” often the largest budget-line area in government spending. At the same time, automating expense reporting tools are helping government financial and IT officials to reduce total operating costs. “This results in a win-win for finance, IT, the agency and their employees,” says Paul Borror in the report, written by StateScoop and underwritten by SAP Concur. Technology that automates processes and increases visibility into employee spending can improve efficiency significantly while reducing costs. In addition, it reduces the time that government workers and their supervisors spend each month documenting and approving expenses, giving them more time to invest in their mission. It can also help to automate certain compliance mechanisms that keep agencies accountable for taxpayer money. Borror, SAP Concur’s senior director for state and local government sales, explains the benefits agencies would see as a whole when adopting a modernized expense reporting system and highlights how even agencies on limited budgets can start taking advantage of cloud-based expense reporting systems. For IT departments, deploying a cloud-based system cuts down on the long-term IT costs of maintaining proprietary technology and provides flexibility to employees in capturing and filing receipts digitally with their smartphones or other mobile devices. Financial departments would see an interest in a system that incorporates a suite of tools to track and control expenses at a granular level. This could represent significant opportunities to improve an agency’s financial management as it provides transparency and reduces the risk of expense errors and abuse. It’s not just departments such as IT and finance that benefit, the reports states. 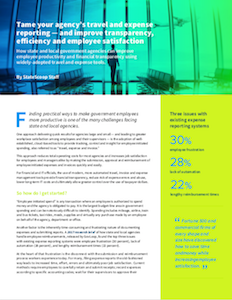 Automated reporting systems save time and money for employees, and evidence from firms in the private sector has shown an increase in overall employee satisfaction, according to the report. Government employees are often frustrated with their current expense reporting process, which is often time-consuming. At the heart of the frustration is the disconnect between submission and reimbursement. Currently, most agencies require employees to retain and submit receipts, record expenses according to specific accounting codes and then wait for supervisors to approve the expenses. After the submission process, the wait period to be reimbursed can take weeks. For those waiting for reimbursement of out-of-pocket expenses, the process is unnecessarily long in an age when there are modern, automated tools currently available. “For government at all levels, using these tools represents better visibility into the use of taxpayer dollars and happy, more empowered employees,” Borror says. This article was produced by StateScoop for, and underwritten by, SAP Concur.